In the case of starting off at the White Cloud Temple on the Yellow River south bank, also head south, only on what looks like the ramp of a highway overpass. This is the extension that connects Baiyin Road (白银路) on the Yellow River south bank, also head south, only on what looks like the ramp of a highway overpass. This is the extension that connects Baiyin Road and the West Gate Mosque with the G109 Road that leads along the River Bank. In both cases, follow the directions and be confident. The Mosque will come into view only at the last Moment, regardless its considerable size. 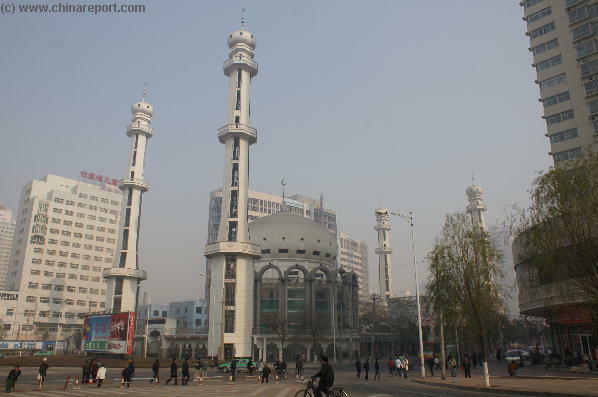 Welcome to China Report's Digital Introduction to Lanzhou Cities' Xi Guan Mosque or West Gate Mosque, located on Baiyin Road on the western end of the Chengguan or Old City District of Lanzhou, Capital of Gansu Province. Google Map of Lanzhou, Chengguan focussed on West Gate Mosque. 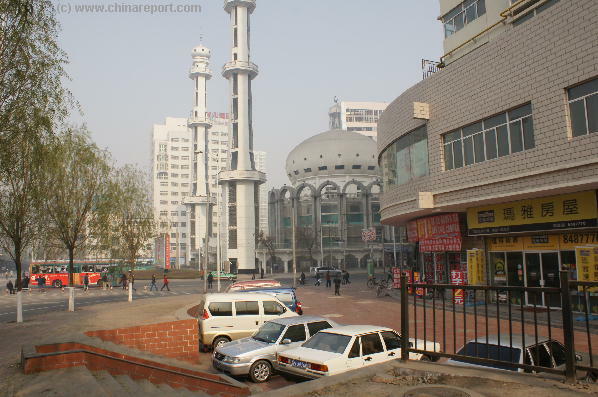 The West Gate Mosque in Lanzhou is the most important but not the only Mosque in the City. Its official name is Xi Guan Qingzhen Si (兰州西关清真大寺), but as it is recognized as the Main Mosque of the Hui Muslim Community within the City and surrounding regions it is also designated as Xiguan Huizu Si, or West Gate Hui Minority Mosque. The Hui are the main Islamic Minority in the City and in southern Gansu Province, as well as in parts of neighboring Qinghai Province, Shaanxi Province and Ningxia Hui Autonomous Region. As the main Mosque of the Islamic Community the XiGuan is also the largest, most visited, most extravagant and most visible in the City. See the XiGuan Mosque visible along the South Bank of the River in the old city district, brightly illuminated by colored lights in the evenings. 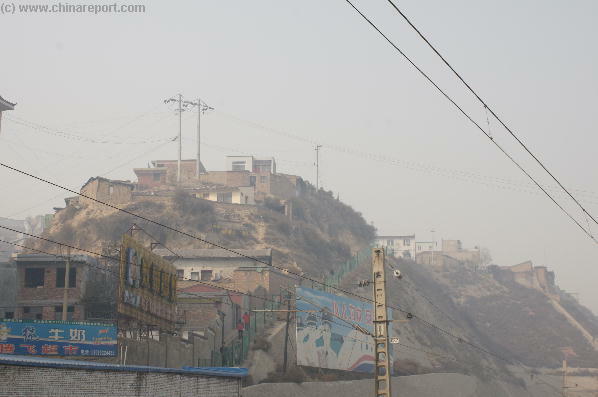 Although the XiGuan Mosque is clearly the largest and most visible Mosque in Lanzhou, it is still not always easy to locate, mainly due to the abundant highrises clogging up the horizon on this city of millions built along a narrow strip of riverside inside an otherwise deep gorge. 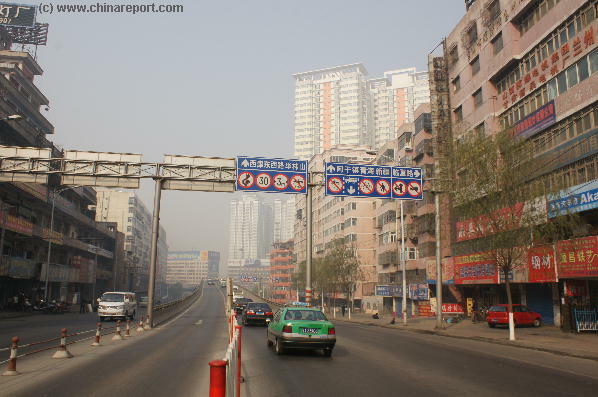 City scape of Baiyin Road in Western Chengguan District in Lanzhou. Although the Mosque stands further down this road, it cannot be seen. 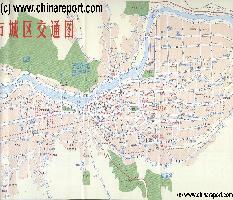 This Schematic overview Map shows the two most important and interesting Districts of Lanzhou, the Chengguan District and the neighboring Qilihe District, West and upstream. The Chengguan, as the original city of Lanzhou holds most of the historic remnants and although full of modern buildings and towering highrises, today is still the main cultural center of the City. Qilihe is home a more modern section of Town fully integrated with Chengguan and including the Western Railway Station. Gritty and dilapidated buildings just up Baiyin Road from the Mosque. There are virtually no signs of islamic Art Styles, let alone architecture. Plenty of Hui live in the area though. near the Western Gate of the City Walls of that Old City. There a several good reasons for its historical location. Most important of these is that in the historical City the Western Side of the City was the part designated for the economicly less succesful, the lower classes, the village poor and the Islamic and other Nationalities. This was a regular arrangement found in cities throughout the West, and in fact the whole of China. During the Ming Dynasty Era (1368 AD - 1644 AD) in Dunhuang and Jiayuguan, just inside the Great Wall of China in west Gansu, Muslims lived in their own section of the City-the West, whereas the Han and well to do took up the other, usually better fortified part of Town. The Han and Muslims thus lived in seperate cities within the larger whole. In the Capital of Beijing a similar situation existed, with the Niu Jie - Ox Street Mosque and Islamic Town located outside of the main city wall, but inside of the Xuanwu District, which was later walled in by itself. The Inner-City of Beijing (Dongcheng and Xicheng) was reserved for the higher classes of society such as Generals, Literati and Scholars, Nobles and their extended families and perhaps a few traders and scientists. This separation is derived from Confucian ideas, which in the past held strong sway over society as a whole and Government thinking in particular. In essence, when everything is assigned its own place and order, society will be more balanced and harmonious. Thus, everyone lived and kept to their own place, as was pious and expected. Whole cities were arranged in this way. Although, those were arrangements common in the far past, interestingly, even today this situation remains, as the district up the Hill and to the South-West of the West Gate is a collection of slums and hutong, which are overwhelmingly populated by the Hui Minority People. Perched along the Hill lies the Fúlóng Píng (伏龙坪 ), a worthwile area to have a browse around in. It is extensive and has many valleys and levels. A section of the Fúlóng Píng (伏龙坪 ), a poor but scenic resedential area of the Hui within Lanzhou City as visible from Baiyin Road. directions. The Mosque is thus ideally located to serve the weary travelers and rich merchants from Central Asia, who had just arrived in Town from the West, which lay across the Bridge. Once in town, all Muslims had to make regular visits to the Mosque which served as the religious, cultural but also trading center. Naturally, those whom had come from afar and made it into Lanzhou, would be greatful to their God Allah for helping them through. At any rate, thus today the Xiguan can be found in the West of the Main City District of Chengguan. 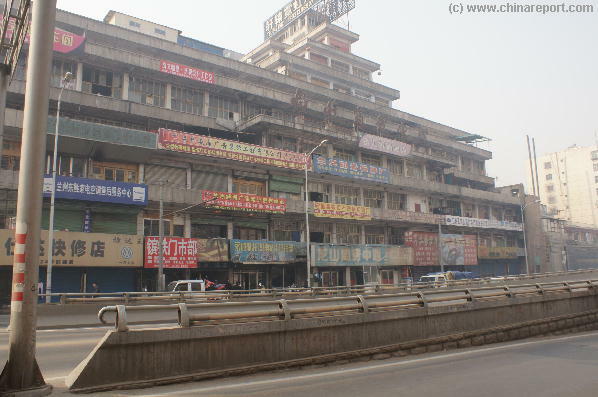 It stands just one block up from the South River bank of the Yellow River in a rather chaotically constructed part of Town. Although with the location clear finding it on foot can still be a problem. In principle there are two ways to navigate efficiently to the Mosque. The First route leads from the River up. View of the West Gate Mosque surrounded by various higher buildings at the very North-Western end of Baiyin Road in Lanzhou. Chengguan District are the most well-known. But there are many more, often smaller Mosques, to be found in Lanzhou. Interesting examples can especially be found in surrounding suburbs (or slums) which are overwhelmingly inhabited by the Hui Minority group. The Oldest and first Mosque to be built in Lanzhou was not the West Gate Mosque but another known as the Xiuheyan Mosque. Although the preaching of Islam had been allowed in China since the year 651 AD in the Tang Dynasty (618 AD - 907 AD), at the Time Buddhism held sway over the Chinese Empire and the routes of the Silk Road were generally well under control of the Tang Empire. Thus, Buddhism was the majority religion in these regions. During this period Tibet was Buddhist, as was the Hexi Corridor of Gansu province, as well as Inner-Mongolia and Mongolia and even what is today Ningxia Hui Autonomous Region. Pedestrians scatter from the bus stop at Xiguan Mosque (Nov. 2007). arrived in the Chinese West via Kashgar (Xinjiang-Uighur AR) and later the conquered Buddhist Kingdom of Khotan. It was only with the defeat of the Tanguts by the arising Mongol Empire that the stop-gap was removed and, making allegiance with the Mongols, Muslims and their faith swept into (North-West) China. During previous period of the Yuan Dynasty (1271 AD - 1368 AD) had been especially prosperous for Muslims, many of whom migrated to these very regions. This was the first time that a need for a Mosque in Lanzhou was felt. Thus, after a change of Dynasty, the first Mosque to be constructed in the city in History became the Xiuheyan mosque which opened during the first year of the Ming Dynasty (1368 AD - 1644 AD) in 1368 AD (Hongwu Reign). Not much later, during the ongoing campaigns to get rid of the Mongols and drive them out of China's North-West, a second Mosque was built in Lanzhou to facilitate the needs of Muslim soldiers and workers in the Ming Army that had arrived in the City. This is the Qiaomen Mosque constructed in 1372 AD. The Xiguan Mosque was built in the year 1398 AD, when no less than three additional mosques were built in Lanzhou. 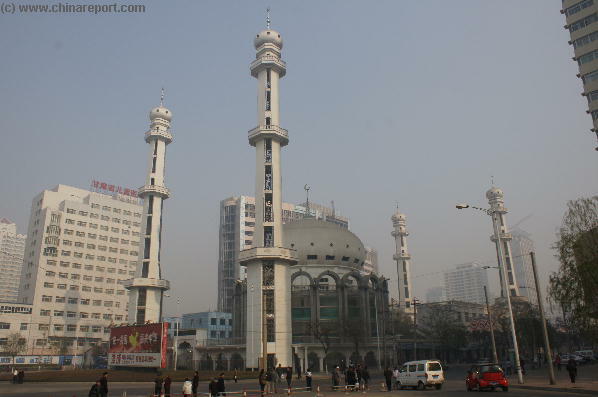 These were the Lanzhou Dongguan Mosque, the Lanzhou Xiguan Mosque and Lanzhou Nanguan Mosque. Since the funds used to construct the Xiguan Mosque in particular were derived mainly from donations by Silk Road Traders, the Xiguan Mosque is also known locally as Guest Mosque. During the next Dynasty, the Qing Dynasty (1644 AD - 1911 AD), Xiguan Mosque was renovated twice. This occured in 1684 AD during the Reign of the Kangxi Emperor and again in 1733 AD under the Yongzheng Emperor. More mosques were built in Lanzhou during the Qing Dynasty and it is known that there were 14 mosques in Lanzhou, at least until the advent of the Peoples Republic of China in the year 1949 AD. The completely modern and strongly Islamic Inspired architecture of the West Gate Mosque in Lanzhou with 4 minarets arranged around a central circular Hall carrying a dome atop. on the side of the Mountain across the River. Along with the Xiguan Mosque all other Mosques in the city and region were destroyed, with only one exception. For reasons relating to the history of the Communist Party itself, the Tongxin Mosque, situated at quite some distance from Lanzhou across the provincial border in Ningxia Hui Autonomous Region was the only Mosque to be spared the wholesale destruction of religion, teachings and artifacts. Read more in: History of Islam in China (6) 'Islam under The peoples Republic 1949 AD - Present'. The current Lanzhou Xiguan Mosque was constructed on its original site in 1983, its architecture intended to mimic and echo the style of Al-Aqas Mosque of Jerusalem. It is reported that in the past the Mosque was painted green and did not have its outer ring of concrete arches. At that time, the central Hall and Dome were surrounded by small shops, as is today still the case at the Nanguan - South Gate Mosque in Yinchuan, Ningxia AR and to a lesser degree the Great Mosque if Xi'an in Shaanxi Province. The shops have since been demolished to make way for both the ring of concrete arches and the four minarets, which have been added to expand the well used complex. Inside the ring of concrete arches is small garden with playgorund equipment for children. Today the exterior of the Mosque is nearly all bright and white. In the year 2008 the large white dome riding atop the circular shaped Mosque saw its roof replaced. day. Inside the main prayer hall one has a great view of the span of the dome, as well as various Arabic details. Large chandeliers provide enough illumination at all times. Usually, there are plenty of visitors, most are Muslims who come to worship at their Temple but tourist infrequently dwell inside. A full view of the Xiguan Mosque with its large white dome and impressively tall four minarets or banke towers. 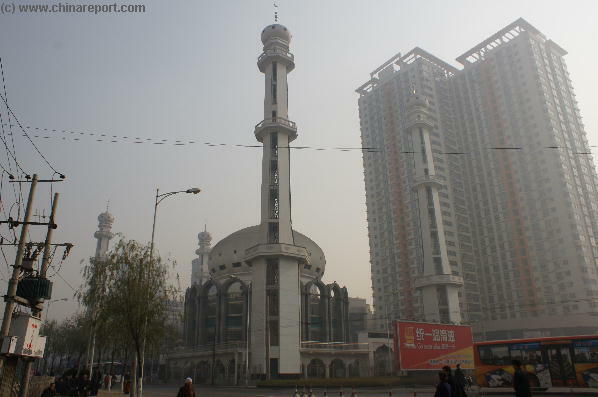 The Xiguan Mosque and even its large Minarets are dwarfed by surrounding appartment highrise buildings. phone, and behave decently. 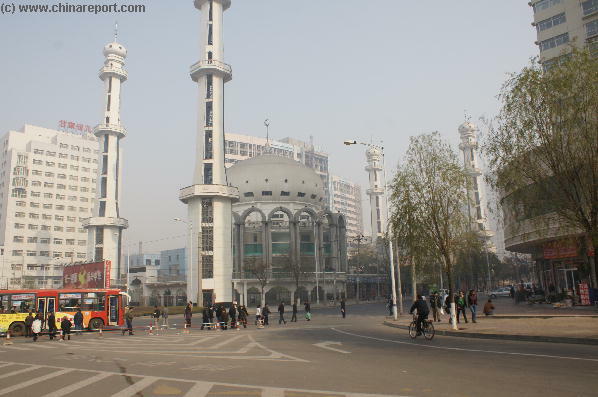 For a complete set of rules, read: Yinchuan Report - 'Nanguan Qingzhen Si - South Gate Mosque'. Apart from woreshippers the building also serves large groups of Chinese students who are affiliated with the Mosques madrasa, where they study Islamic fiqh, secular education and arabic language. The monastery of Xiguan has trained a large number of classics Islamic scholars. Gonglin Road Mosque, Nanguan Mosque, Pinliang Mosque, Waterside Mosque, Xiyuan Mosque and Xiu Riverside Mosque. (Find them on our: Google supported MasterMap of Asia). Schematic Map of the many sub-pathways of the Silk Road in China clearly showing the one-unavoidable pathway over Lanzhou and into the Hexi Corridor. either the Zhongshan Bridge or the White Cloud Taoist Temple. From the Zhongshan Bridge walk south and away from the river along Zhongshan Road to its intersection (a commercial center and roundabout) with Zhangye Road. At the intersection, turn right (west) into Linxia Road, which is one of the main shopping streets in Chengguan. Walk through the long Linxia Road shopping zone and at its very end turn left and south again on Baiyin Road. Baiyin Road looks like a highway overpass system, but just a bit further south the situation changes. Here is a wide space that houses the West Gate Mosque.